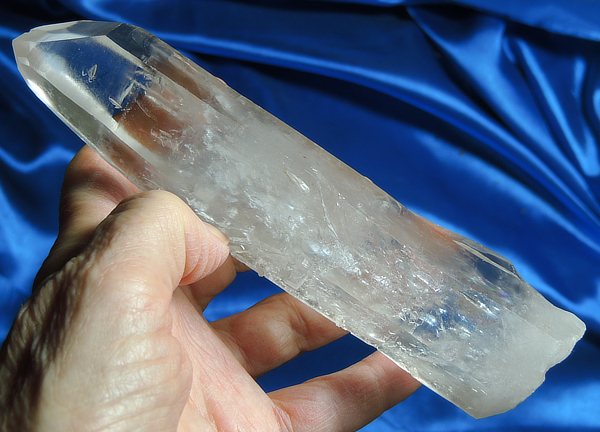 This is a long and amazing 10 oz, 6.4“ by 1.5“ by 1.4“ slightly-curved quartz wand from Brazil with a healed base. He is a very light smoky color with shovel termination that also features a small past timeline, a larger future timeline and a wonky-looking window. Two of his sides hold a few tiny students and quite a number of small keys where students once resided. His sides feature Pleiadian, Lyran and Virgo starbrary glyphs that will keep you reading for a long time … so he is also a master starbrary! His information is for a special Star Seed who will be able to well-glean this data. There are a few very small to tiny dings of no significance … he is truly stellar (pun intended!). Further, from the first channelings that came to me through Mirahh, additional information has come forward from other star systems, other formations and more intense details. This Spirit falls into the later category. Similar to lightbrary crystals that function as libraries of crystalline records, these crystals hold libraries of star information, emerging now to assist Star Seeds with Pleiadian roots. Before a giant tsunami wiped out Lemuria, Lemurians were sent all over Earth to "seed" Lemurian/Pleiadian culture so that it's gentle and peaceful guiding principles would be available to all earthly peoples. The Pleiadians brought philosophy, ethics, art and many other wondrous things to Lemuria. Now, it is interesting to note that the Pleiadians colonized many planets, and these peoples in turn colonized others, so the Pleiadian roots may run deep through many Star Peoples. Each Star Seed will be attracted to a crystal with information specific to them and their own needs at this time. This is a very personal crystal and once bonded with his Keeper, should be kept in a sacred area where others will not handle him.